Darkness of Light is the story of Ember Brycin, a teenage girl who has often lived a life of isolation and mystery. Following the brutal death of her mother, Ember has been the root of a number of abnormal situations. At her junior high school, she was forced to transfer after an explosion. She and her father transfer to a town that is in a whole different state in hopes to escape these accidents and the painful loss of the one woman who brought them together. Only at her next school, it happens again. And again. And again. Ember gets sent off to Silverwood, a specialized school for teens with “problems that must be handled safely.” At Silverwood, she meets Eli Dragen. And everything changes. Ember has always known that she is different from the other kids around her. She knows that her different colored eyes and her long sentimental tattoo only bring about more attention towards her. But she has never known the mystery that is her childhood. She does not know of the legacy that her mother left behind, or why she was so desperate to keep Ember a secret. Mysterious Eli and his world are the key to determining the secret of her identity and the mysteries that her mother left behind… And when the truth presents itself, Ember must decide who is trustworthy and who is not. In her new found world, everyone has their own agenda. I really enjoyed reading this book. I loved Ember’s character, as it is not often that one finds a strong, independent heroine. Ember is snarky and misunderstood, she accepts all responsibilities and blame when things go wrong. She is as strong of a protagonist as Eli is a love interest. Eli is a strong character in his own right. I loved his honor and loyalty towards those he attaches himself to, and his need to protect Ember, although they both know that she does not need his protection. I liked the development of their relationship, it took a while for them to admit the attraction between each other and I found the banter between them to be one of the highlights of the book. I also loved the idea of Torin, a character introduced in Ember’s dreams who seeks only to protect her. 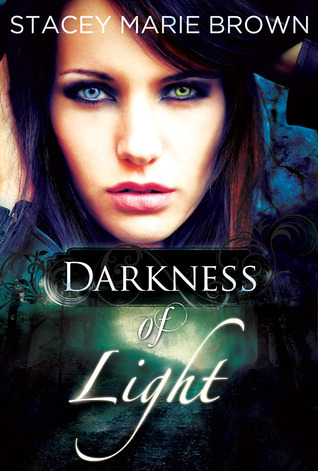 Darkness of Light is an extremely well-written story, with a fresh storyline and likeable main characters. It is different from the general stories of the paranormal genre, and for that I applaud Brown. It is the start of a world that Brown has written extremely well, and I am curious and interested as to how the story will play out in the later books. I will definitely look out for book two of this series. While Darkness of Light includes the typical aspects of a new/young adult book, it is really the story of a girl who has never known her place in the world. For this reason, I would recommend this book for anyone who is in Ember’s position: a bit lost, kind of confused, constantly worrying that they will never find their place in the world. Ember learns exactly what she is and why she is so different from the people that she has grown up with… And I think we all need to remind ourselves that we will all get to that place eventually.